The Bergen Record has an important story today on a US Geological Survey (USGS) study that found dual sexed fish in the Wallkill River and Great Swamp. (read study here). Male fish in two of North Jersey’s most protected areas have developed female sexual characteristics, suggesting parts of the Wallkill River in Sussex County and the Great Swamp in Morris County are contaminated with chemicals that throw hormone systems radically off. The story should trigger public outage and calls for stronger programs to monitor and install pollution controls to reduce the discharge of these chemicals to NJ streams and rivers. Public outrage will ensue, especially if the public fully understands the implications of the science and the DEP’s regulatory failure to act to protect the public, which the Record story not only failed to present, but gave DEP a pass on (see map above, and this post: Warning: This Map Can Make You Sick). New DEP regulations also should require that public water supplies install granular activated carbon (GAC) treatment systems to remove them from drinking water. GAC is readily available and relatively inexpensive treatment technology that is very effective in removing these chemicals. The DEP and NJ Drinking Water Quality Institute regularly evaluate the performance of and recommend installation of GAC technology as available treatment. Trenton — New Jersey should filter its drinking water to remove hundreds of chemicals, most of which are unregulated, from its drinking water supply, according to a rulemaking petition filed today by Public Employees for Environmental Responsibility (PEER). The plan to screen many chemicals out of tap water was actually developed by the state Department of Environmental Protection (DEP) but has been in limbo for the last six years. State testing has detected “approximately 600” chemical compounds “in 199 samples collected” including five brands of bottled water, according to a recent DEP white paper. The vast majority of these chemicals, including pharmaceuticals, hormones, and cleaning products, are not regulated by either the federal or state government. As a result, there is no regulatory effort to reduce or eliminate them from drinking water. The April 2010 DEP white paper, entitled “Investigations Related to a ‘Treatment-Based’ Regulatory Approach to Address Unregulated Contaminants in Drinking Water,” advocates used granular activated carbon filtration and other techniques to remove most chemicals in drinking water, noting that carbon filtration alone removed more than half of identified chemicals. “How to address the fact that wastewater treatment plants don’t capture all of these chemicals before discharging their effluent remains the subject of many studies that are looking at ecological impacts, relative health risks, and potential costs of various treatment technologies,” said Larry Hajna, a DEP spokesman. …. “The most recent USGS study adds to our knowledge of this issue and impacts to ecological systems, but the scientific community overall still has more questions than answers on human health impacts,” Hajna said. But Record reporter Scott Fallon ignored the public health risks and drinking water issues, which is stunning, given the example right under his nose in the Passaic River. Let’s hope he investigates and reports on those concerns in followup coverage, if only in response to what should be public outrage. We’ve researched and witten about unregulated and endocrine disrupting chemicals several times. Second, the sewer plant will discharge new pollution loads … and organic chemicals, including things like household hazardous chemicals, contraceptive, prescription drugs, and endocrine disrupting compounds from the metabolism of pharmaceuticals. … most of these pollutants are toxic to plants, fish and aquatic organisms and some of the organic chemicals are causing profound ecological damage, including recentstudies that have shown “dual sexed” fish in the Delaware River. DEP simply ignored those comment and issued the permit to the facility with no monitoring and pollution control requirements for these chemicals. 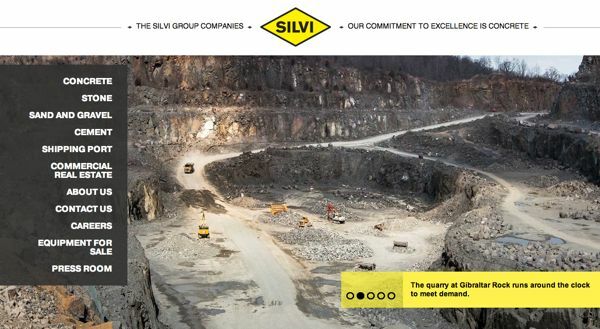 There was no press coverage or outrage by environmental groups over this permit. The USGS and NJ DEP have documented hundreds of unregulated chemicals in NJ rivers and over 500 in NJ drinking water supplies. These chemicals include carcinogens and human endocrine disruptors that cause serious health effects, including reproductive and behavioral problems. These chemicals impact ecosystems as well. Ecologically, the majority (>50%) of fish sampled in a recent study on the Delaware river were found to be dual sexed – male and female in the same fish. But bowing to NJ’s powerful pharmaceutical and chemical industries who profit from these toxic chemicals, the Christie DEP is covering that up. The DEP (Governor’s Office?) even appointed and allowed a Dupont corporate official to drive the science policy question of how to regulate them – see the most recent Report of the DEP Science Advisory Board for the details of that. We have written about that scandalous abuse and been totally ignored. Instead, the press writes Big Pharma cover stories about police drug enforcement oriented collection programs. 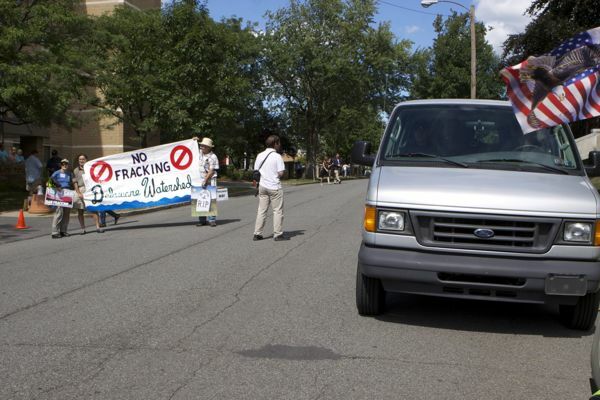 DEP simply ignored that – again – and so did NJ press corps and NJ environmental groups. The new USGS National Water Quality Assessment Program data are just demonstrating the need for additional regulation of a wide variety of currently unregulated contaminants, including endocrine disruptors and pharmaceuticals widely found in rivers and drinking water – so it looks like Christie seeks to derail that effort via stealth. [End Note: I correctly predicted that the Christie DEP would do nothing to regulate these chemicals. That prediction was not based on tarot cards, Astrology, or reading tea leaves. That prediction was based on first hand knowledge and experience at DEP, specifically including my work on a 2002 regulatory proposal of what are called “wildlife criteria” to regulate toxic chemicals based on adverse impact on wildlife and ecosystems. Take a look at the scandalous power the chemical industry wields with impunity. In this letter, they openly THANK DEP for gutting a major regulation. Campbell was pro-environment and pro-regulation, but he caved to incredible industry power and abandoned the proposed new regulations. There was virtually no public awareness, media coverage, or criticism by NJ environmental groups for that collapse. There was no political price to pay, by public officials or corporate industry interests. So, if the Campbell DEP collapsed, it was very obvious that the pro-business and anti-regulatory Christie administration would not do anything to protect public health or the environment. Perhaps what disgusts me most is that after all this history and all my work to discloses and warn about these risks, at subsequent scientific studies documenting he problems, STILL the media and the public and the environmental groups don’t get it. The USGS study safely targeted the Wallkill and Great Swamp National Wildlife refuges, places where there are few industrial and sewage dischargers to blame for the pollution. They targeted ecological effects, which prompts no real concern from the public. 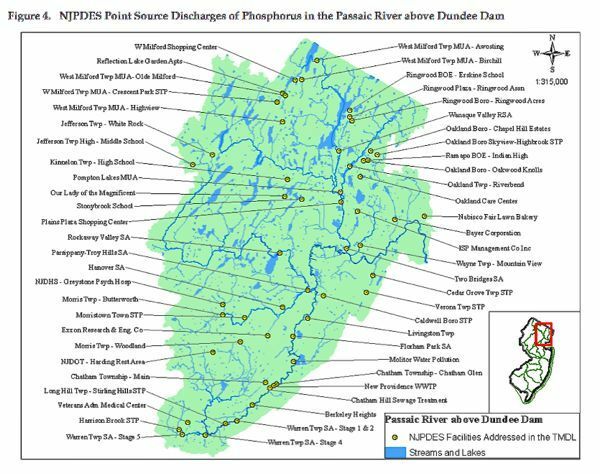 For example, USGS could have sampled the Passaic or Ramapo or Delaware Rivers directly upstream of drinking water intakes and included a discussion of the human health implications of those chemicals detected. The polluters’ political power (Big Pharma and the Chemistry Council) is so strong that even US EPA has backed off their oversight of NJ DEP on these issues. The press (Record) wrote the story in the least inflammatory and least controversial way possible and gave the Christie DEP a huge pass. It’s not the first time Scott Fallon and the Bergen Record have done this cap. They do their readers a grave disservice in failing to write the real story and hold public officials, DEP, and corporate polluters accountable. Finally, I must note that NJ environmental groups have largely abandoned this kind of traditional meat and potatoes work on clean water, DEP regulation, and facility permits, and public health risks from toxics. The abandonment began long ago (see: Clean Water Anyone?) – no one showed up! Environmental groups have been manipulated by Foundation grant money that has diverted them from these controversial issues and instead been funded to work on politically safe issues that don’ threaten powerful chemical and pharmaceutical industries and their friends in State government, like sustainability, the Delaware Watershed (Wm Penn and Dodge Foundations) and the Dodge Foundation funded “The Raritan Initiative”, which Rutgers has shamefully joined as well. You simply do not see well informed and hard hitting critiques like this anymore – they have been defunded by the Foundations and abandoned by the environmental groups. I went to the Pinelands Commission’s meeting this morning expecting to listen to a staff briefing on climate change. Lohbauer had the integrity to defy the Gov. and vote to oppose the South Jersey Gas pipeline – leadership that I’m certain influenced NO votes from other Commissioners – and the independence to buck the Governor on a host of other issues. He even had the temerity to write an Op-Ed – twice! -proudly defending his pipeline NO vote and upholding the integrity of the CMP (see this and this). 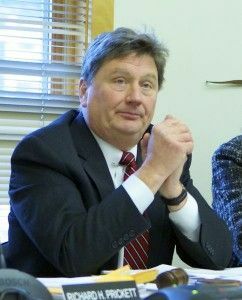 Earlen voted in favor of the pipeline and has played a passive role at the Commission, rarely making any public comment. His background is in construction and development, so bright red flags are raised, even without the obvious Gov. Christie reprisals. Take a look at his employer’s website, where Earlen serves as Vice President for Real Estate, Environmental and Public Affairs – is this compatible with the mission of the Pinelands Commission? Lohbauer always provided plenty of opportunity to allow the public to speak and he treated people with respect and listened to their concerns – this is the opposite set of values than the arrogant authoritarians who populate the Christie administration. Perhaps Lohbauer’s support for addressing climate change was the last straw that sealed his fate. Or it could have been his remarks that were critical of Christie’s pawn ED Wittenberg or the Gov. Conditional Veto of the soccer fields bill. Add Lohbauer to Christie’s long and growing hit list of Pinelands Commissioners Jackson, and Commissioner Ficcaglia and Commissioner Lloyd. (that doesn’t count similar Christie attacks on those who have integrity and independence, including Highlands Council Director Swan – and Legal Counsel Tom Borden, who resigned in protest). It’s not even technically official yet – Earlen was not yet sworn in – but its been posted prominently on the Commission’s website (ED Wittenberg probably wrote it herself in glee). To make matters worse, instead of a briefing on climate change – which I warned was being derailed behind the scenes by Executive Director Wittenberg – the Commission was besieged by the off road motorized recreational community, commonly derogatorily referred to as the “mudders”. Substantively, the “mudders” don’t have a leg to stand on scientifically or politically – not many people would support monster trucks doing donuts in sensitive vernal meadows, wetlands and stream channels. But bureaucratic incompetence and arrogance by the Pinelands preservation advocates has surrendered the reasonable policy high ground. The Christie DEP gave the mudder faction 2 strong legs to stand on by totally mismanaging the DEP’s Motorized Access Plan (MAP) to restrict off road access and close certain roads. Making similar mistakes, Pinelands conservationists – by working covertly behind the scenes with DEP in developing the MAP before it was publicly vetted in DEP’s flawed “Stakeholder” process – gave the mudders a rope to hang DEP and themselves with. Those mistakes have not only forced DEP to retreat and discredited the MAP initiative, they have generated a huge backlash and empowered mudders and a supporting group of more responsible motorized allies. The DEP retreat has emboldened the mudders and made a growing problem even worse. After the Christie attack and onslaught of the mudders, we were then treated to a briefing on how affordable housing litigation could overwhelm the Pinelands with far more housing units and density than allowed under the Comprehesive Management Plan and approved local zoning scheme. Staff presented a crude analysis of COAH obligations under various analyses now before the courts and how those numbers on affordable housing obligations would impact certain Pinelands Towns under CMP requirements. Despite appeals from Commissioner Lloyd and public commenters – including myself who recommended filing a amicus -,the Commission seemed very reluctant to get out in front of the COAH freight-train. The best they could even imagine was to try to write a letter to someone laying out their concerns about threats to the CMP. Hello! Don’t just stand there, DO SOMETHING! Next Steps: Resubmit proposal to Governor’s office. Perhaps the Pinelands lawyers can tell me where the law says that all CMP amendment rule proposals must be submitted to and approved by the Governor’s Office before NJ Register proposal – just where is that requirement in the Pinelands Act or the Administrative Procedures Act? My understanding is that the Gov. has power to veto the minutes – that is very different than a power to approve rules before they are released for public view or proposed in the NJ Register. I was particularly disgusted with the runaway from the commitment to adopt CMP amendments to implement the ecologically based water allocation restrictions known as the Kirkwood-Cohansey project. It was perhaps the worst day in Pinelands history – the only thing that can put some brakes on this runaway train is either litigation, direct action protests, or the federal government. Each of these issues require an individual post, which I hope to get to in the coming days. I have found an institution I can believe in and trust and whose mission and principles I support wholeheartedly, The Climate Disobedience Center. Let me explain. Last night, I again heard Tim DeChristopher interviewed on Democracy Now! (you can watch here). Tim, AKA as “Bidder 70″, founded the center – along with, among others, former NJ PIRG Director Ken Ward. I’ve followed and have deep respect for both Tim’s work (see Peaceful Uprising) and Ken’s work (Bright Lines). The Center seems like the perfect and logical outgrowth of that incredible work. But Hedges’ appeals to rebellion are often abstract and grounded almost exclusively in moral reasoning. 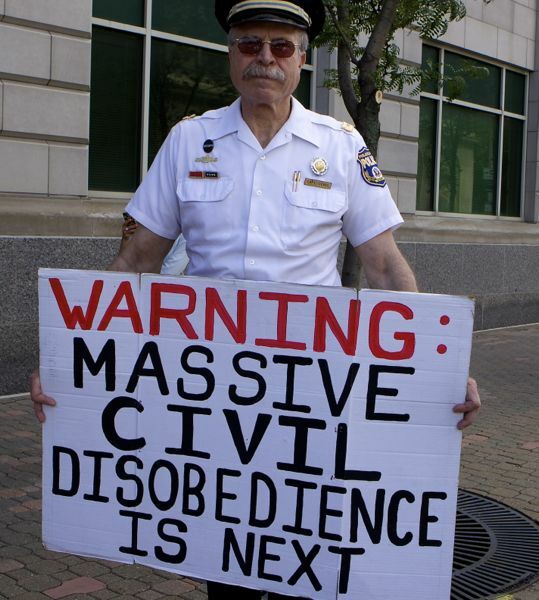 In supporting contrast, the Climate Disobedience Center seems to focus on and support very concrete, actual cases of rebellion and non-violent civil disobedience. The roadmap to implement Hedges’ moral imperatives. The rationales for rebellion are grounded not only in moral and ethical reasoning, but in science and legal reasoning and pragmatic political organizing. … so we’re going to continue working with the folks who are standing up against it. So, I’m working with them. I’m also working with the Keep It in the Ground campaign that is calling for an end of fossil fuel leasing on public lands. So I’m kind of involved in a lot of different things and trying to remain as independent as possible in the climate movement, because—because it’s such a rapidly shifting crisis. – when you this, this extremely rapid, rapidly developing crisis that—where we’re up against an opponent, the fossil fuel industry, that is also adapting to what we’re doing. So, you know, I think trying all these new things in a lot of different new ways is critical. And part of the reason that I’m an independent activist is that what we’re seeing is that our institutions have this inertia, whether that’s big climate organizations or, you know, the academic organizations that I’ve spent a couple years with at Harvard Divinity School. They’re not keeping up with the pace of the crisis. They’re not adapting. They get bogged down in this inertia. And so, part of the reason that I’m involved in this film is that it was able to tell the truth in a different way than either of the climate organizations that I’ve been involved with, who are scared to talk about what it means to be too late to stop climate change, or even the academic institutions that I’ve been a part of, that also are—I think, aren’t keeping up with the pace of the crisis. AMY GOODMAN: What’s the campaign called? TIM DECHRISTOPHER: —that whole system. It’s called the Keep It in the Ground campaign, with Rainforest Action Network, Center for Biological Diversity, WildEarth Guardians. A lot of big organizations now are challenging that whole system. And they’re trying to move past this sort of one at a time, stop this destructive project, try to fight off that destructive project, and say this whole system is broken. It’s all ignoring this overwhelming threat of climate change, and we need to stop the whole system. Tim is absolutely correct in his analysis of the institutional flaws, inertia, and lack of creativity, in both the climate/environmental movement and in government. The whole system is broken. Chris Hedges also writes about how what he calls “demonic institutions” are incapable of truth telling and willing to sell out or even to crush individuals within those institutions who criticize them. Hedges’ book “The Death of the Liberal Class” provides a scathing historical analysis of the corruption and collapse of liberal institutions – that same critique holds for the environmental movement as a social institution. I’ve long thought about the interface of these issues and share Tim & Hedges’ views (see Hedges’ Days of Revolt) – that’s one reason I got forced out of DEP and also have tried very hard to remain independent of the environmental movement. My own experience with the worsening failures of government and the inherent flaws and limitations of the regulatory approach have radicalized my thinking. I now see rebellion, revolt, and direct action non-violent civil disobedience as essential tactics – perhaps our only choice at this juncture. 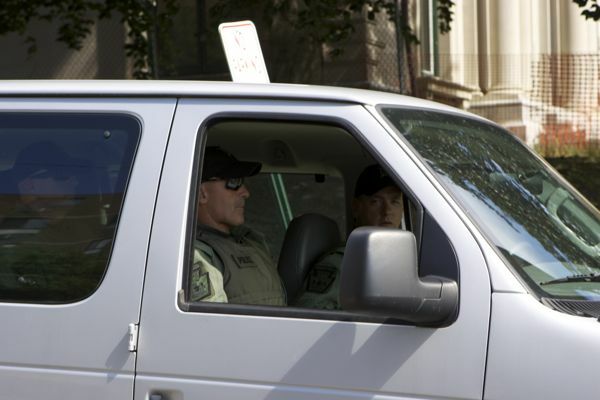 Are they local, county, state or federal police? Mr. Hurdle correctly diagnoses the problem, but doesn’t quite get the criticism of the Christie DEP policy side of the story or grasp the implications for the future of the barrier islands. We need to start talking about and planning for strategic retreat: ways to abandon existing development and move to inland higher elevations. Sea level rise will permanently inundate current development. So, we either make the retreat rational and plan for it, or conditions will force a chaotic retreat. 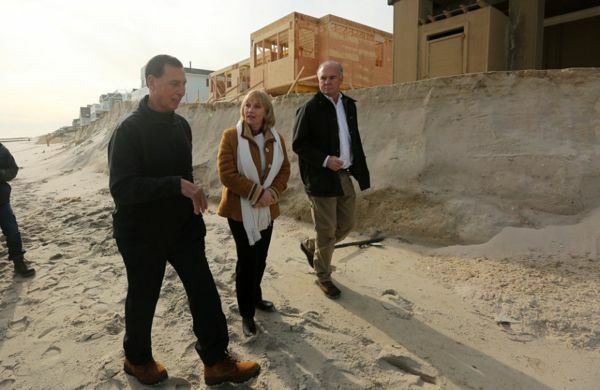 The current Christie Post Sandy program is driven by an imperative to “put it all back” where it was and protect it with engineered dunes and beach replenishment. The Christie “Rebuild Madness” policy is exacerbated and enabled by NJ’s “right -to rebuild” laws. That approach is seriously flawed and ineffective (for both ocean side and back bay risks). It fails to address the reality of climate change, sea level rise, and more severe coastal storms. And it is not cost effective or economically sustainable. Besides, what good is living in an elevated house on pilings when there is no electric power, roads are flooded, no food available, no stores open, schools closed, and no water or sewer? To paraphrase Shillary, it takes a village. Strategic retreat is the only answer. And the Christie “rebuild now!” driven DEP is a big part of the problem – the story failed to note that DEP is weakening coastal and flood protection regulations, trigging a rare legislative veto initiative. Now that another extreme weather coastal storm has subsided and people have dug out and are returning to normalcy, the press predictably begins to try to explain the situation. Following what is now an entrenched pattern, the same suspects come out to spin the story, most notably Gov. Christie, who touts his leadership and “model” response – egregious lies the media swallows whole cloth and transcribes, with no independent assessment or critical pushback or alternative plans. Following the pattern, after the first round of political spin coverage, the press then move on to consult with the “experts” to assure everyone that things are fine, no big deal, don’t worry about that climate thing – and again turns to the same old cheerleaders. They never print an expert who will tell the truth – that Christie’s shore recovery plan is a boondoggle and a proven failure. The story was contradicted by the photo that ran with it. Readers that want truth not spin should visit the Press of Atlantic City’s coverage and photo gallery – or even the North Wildwood Police Department’s twitter feed, who posted some great pics. Hi – unfortunately, you buried the lead in the closing quote and misled readers – again. Ask Prof. Farrell, who is NJ’s biggest cheerleader for beach replenishment and dunes, if they do anything to protect back bay flooding risks. Rutgers professor Mike Kennish has called back bay flooding the “achilles heel” of the whole recovery plan. Do an experiment: Take a look at a map, then count the buildings along the 128 mile shoreline. Call this group A. The far smaller Group A gets BILLIONS of dollars of ineffective protection. The much larger Group B gets ZILCH. Does that make sense? That’s the story. Plus, the Christie DEP is rolling back flooding and coastal zone regulations, which have triggered opposition by EPA, FEMA and the NJ League of Municipalities – the NJ Legislaure just exercised Constitutional power to veto these DEP rules. Amazingly, the Record has not reported on any of that. Why? Update – my apologies to Tom Moran, who gets it right. The 1 foot “freeboard” standard was adopted way back in 2007 by the Corzine DEP. 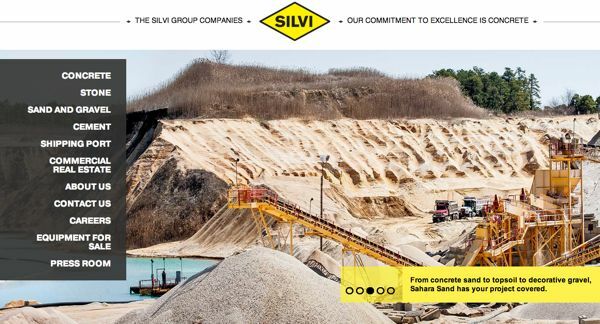 Update #2 – here’s another example from NJ.com – see the photo caption – those are piles of sand, not dunes. Note new construction in harms way. Story ignores all that. In Margate there was indeed some flooding on the streets. But the water came from the bay, not from the ocean. 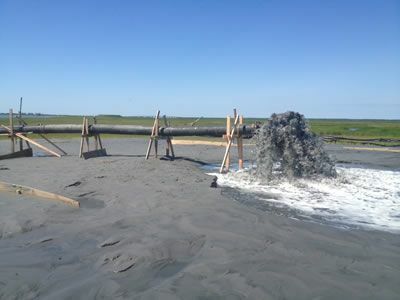 The town’s refusal to sign on to the sand-replenishment project had nothing to do with it, said Mayor MichaeI Becker. When I called him yesterday he described watching that press conference on TV. This was no surprise, he said. Beach towns in Atlantic and Cape May counties routinely flood when bay levels rise. Yet the town got no response when it applied for a grant to beef up bulkheading on the bayfront, Becker said.